Refill with Friends!You will learn how EASY it is to make your own candles at home! Every other Wednesday from 6:30 - 7:30pm ~ Please join us! The class and demonstration is FREE. Bring your clean, empty container from home. If you plan to have us fill a jar for you, it will need to be kept with us overnight. Refill supplies can be purchased at our Dundee Outlet Store. Free refreshments & FUN! Refill with Friends! Monday thru Saturday 10:00 a.m. to 8:00 p.m. Sunday 11:00 a.m. to 6:00 p.m.
Sunday 11:00 a.m. to 5:45 p.m.
More than 5000 Square feet of Antiques, Candles, Coffee. Located in 3 restored historic buildings overlooking the River Raisin in a National Historic District. 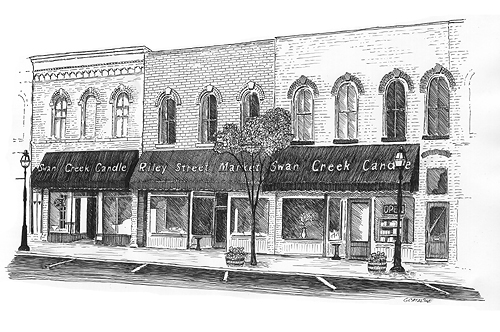 We opened our first historic building as a Swan Creek Candle Store in 1997. Eight buildings and stores later, Dundee remains our premier flagship store. The setting is picture perfect. Decks overlook the river and historic Old mill. It just doesn't get any better!